For various reasons Edele Hotel isn’t the place intrepid independent travellers would normally go for, but it does have some noteworthy features such as a central location and a rooftop swimming pool (albeit a tiny one). Ad Book now! Rates from US$26.13++. Average rating 8.2 from 512 reviews. The reasons why you’d want to stay at this 10-storey three-star hotel: the deluxe rooms are great and come with all the modern city hotel-type amenities. Rooms have purpose-built dark wood furniture and comfortable beds with bedside table, lamp and plugs. Amenities include safety box, minibar, hair dryer, WiFi, coffee/tea and flatscreen TV. Bathrooms feel upscale, with quality glass shower stall, both rain showerhead and regular nozzle. The “senior deluxe city view” rooms have the added bonus of a bathtub and a balcony. We’ve noticed significant discounts on online booking sites – sometimes 50% off the regular rate, so do check for a bargain. Edele Hotel has no soul but it can be fantastic value if you score an online deal. Now the drawbacks: The hallways are dirty and strewn with bits of rubbish. Smoking is also allowed in the hallways. The hotel is popular with tour groups so expect an impersonal experience. The “gym” of a single stationary bike and treadmill in a random corner is comical, as is the “skybar” which is simply a covered terrace open on one side with a few uncomfortable chairs. There are only five sun loungers around the pool that are “reserved” by people’s belongings; you’d have to get in there early if you want any chance of taking one. Though the superior rooms are similarly furnished, they are small and have no windows – not for someone who gets claustrophobic easily. Again, check online for deals and go for the deluxe. 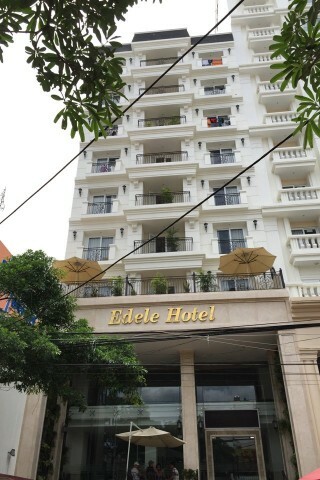 Check rates at Edele Hotel on Booking.com.